1. To elect an alumni manager to the Incorporated Management Committee of St. Joseph’s Anglo-Chinese School for the term of 1st September 2017 to 31st August 2019.
a. At the Special General Meeting, the alumni manager will be elected in accordance with Article 44.2 and Appendix I of the Association’s Articles of Association. b. Subject to Article 25, any member entitled to attend and vote at the Special General Meeting is entitled to appoint one proxy to attend and on a poll, vote in his stead. A proxy must be a member of the Association. Each member may only be appointed as a proxy by no more than 5 members. c. To be valid, the proxy form must be deposited at the Association’s registered office at Unit 1303, 13th Floor, Tower 1, Admiralty Centre, 18 Harcourt Road, Admiralty, Hong Kong not later than 24 hours before the time appointed for holding the Special General Meeting or any adjournment thereof (as the case may be). d. Completion and return of the proxy form will not preclude a member from attending and voting at the Special General Meeting or any adjournment thereof (as the case may be) should the member so desires. e. Details of nomination an alumnus for election as the alumni manager of the School at the Special General Meeting are set out under Appendix I of the Articles of Association. f. (i) An alumnus who had attended full time education (irrespective of the number of years) at the School shall be eligible to stand for election. An alumnus who is a teacher of the School excepted. (ii) All alumnus who had attended full time education (irrespective of the number of years) at the School shall be entitled to second a candidates. (iii) The candidate and the seconder must fill in and sign the nomination form which can be downloaded from the Association website www.sjacs.com and return the same to the Association by sending it to “The Josephian Association Limited c/o Mr. Peter Yeung, Unit 1303, 13th Floor, Tower 1, Admiralty Centre, 18 Harcourt Road, Admiralty, Hong Kong” at or before 4:30 p.m. on 6th July 2017 (Thursday). (iv) The Returning officer shall cause a list of candidates, their seconders and their respective brief statement and/or c.v. to be posted at the Association website on or before 20th July 2017.
g. If typhoon signal no.8 or above remains hoisted or a black rainstorm warning signal is in force at 9:00 a.m. at the date of the Special General Meeting, the Special General Meeting will be postponed. Members are requested to visit the website of the Association at www.sjacs.com for details of alternative meeting arrangements. The Special General Meeting will be held as scheduled when an amber or red rainstorm warning signal is in force. Members who have any queries concerning the alternative meeting arrangements, please call the Association 25268633 during business hours from 11:00 a.m. to 5:00 p.m. on Mondays to Fridays, excluding public holidays. Member should make their own decision as to whether they would attend the Special General Meeting under bad weather conditions bearing in mind their own situation and if they should choose to do so, they are advised to exercise care and caution. h. The translation into Chinese language of this notice is for reference only. In case of any inconsistency, the English version shall prevail. 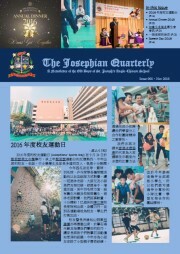 The fifth issue of The Josephian Quarterly is now available for download or online viewing. In this issue, you'll not only read about various old boys' and school's events that have taken place in recent months, but also learn how an old boy's life was touched by one of the founding teachers of SJACS. By the way, don't miss the opportunity to join our upcoming annual dinner on 26 Dec 2016. 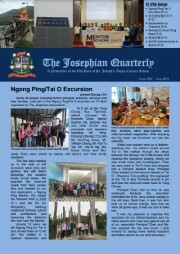 Details are available in this issue of The Josephian Quarterly. See you on Boxing Day! 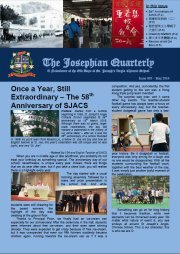 Remember to check the Josephian Association's website (www.sjacs.com) often to stay abreast of the various news and upcoming events. 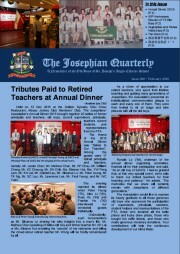 The fourth issue of The Josephian Quarterly is now available for download or online viewing. This issue features several seemingly unrelated articles: King Tong ('70)'s story – one that will likely make you look back on your own days at SJACS, the article that calls upon all old boys to help save our old secondary school campus – an incredibly daunting, but not impossible, task, and Mr. Tang's article on SJACS's mentorship scheme. Yet, there's a thread that runs through them: the St. Joe spirit that Bro. Paul Sun has afforded us. As abstract as it may seem, I hope you agree that it is something that resonates in the heart of every Josephian. Let's keep it alive in all of us! Copyright © 2016 The Josephian Association Limited. All rights reserved.